Were your grandparents vegetable gardeners? What about your parents? Are you? According to a National Gardening Association’s 2010 study gardening is on the rise; of the household surveyed 37% are doing some of their own food production. That's a 19% increase from 2008-2009. Why Do Folks Want to Grow Their Own? If this were my personal list, I would add educational opportunity, exercise and stress relief. Plus plants are pretty. This is one of my favorite vegetable gardens. It is on a private estate in Pennsylvania and is one of the last designs that Rosemary Verey did State side before she died. 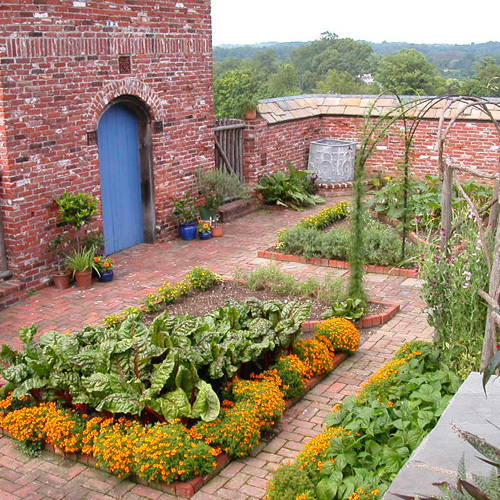 Proof that vegetable gardens don't have to be hidden in the back yard. The orange are marigolds, a variety similar to Starfire Signet Marigolds available from Seed Savers Exchange. You don't have to have a space this big to grow vegetables. 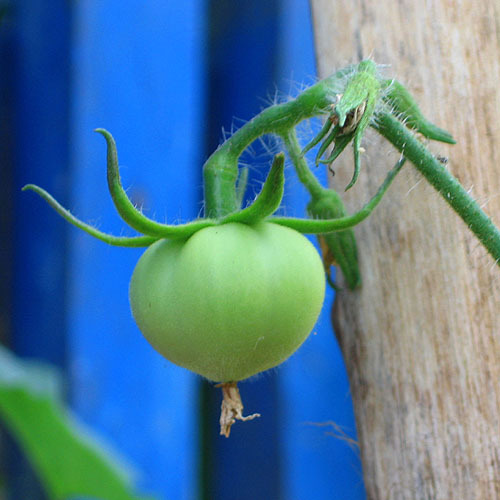 You can grow a tomato in two feet square in the ground, a raised bed, or a big pot on a balcony, patio, or strip of land along the side of your house. 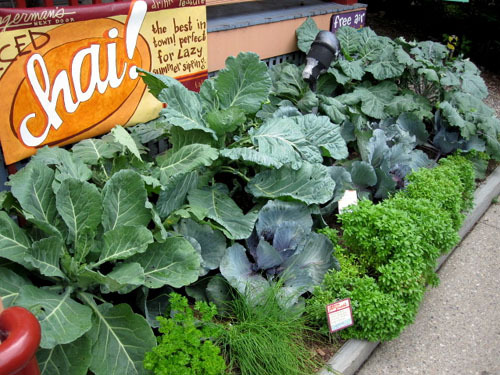 Here's an edible landscape at Zingerman's Deli in Ann Arbor, Michigan. There is some large kale in back and parsley, basil and chives up front. 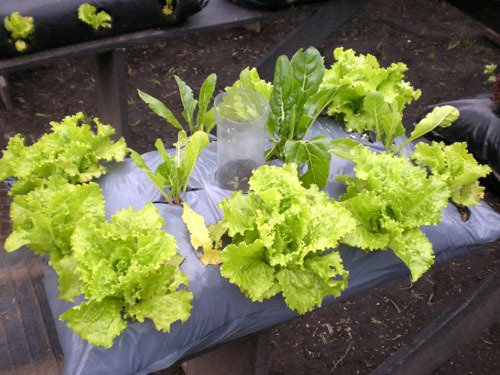 You could even just put some holes in a bag of soil and insert some lettuce seedlings. Where ever you chose to start your garden make sure you have at least eight hours of direct sunshine and access to water. It could even be your window. 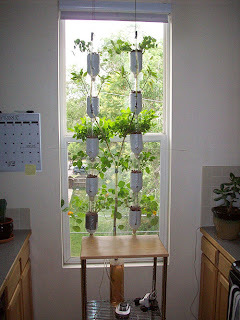 This is a hydroponic window farm from windowfarms.org. An electric pump on the shelf below pumps nutrient rich water up to the top plants every thirty minutes. The water trickles down through all the plants and their roots back to the basin below. All you need is a window - preferably south facing. Now is the time to start thinking about your potential garden. The frost free date in the Midwest is May 15. That's when you want to start your garden to get maximum growing and harvesting time. What you'll eat. If you don't like green beans, don't plant them, even if you will get buckets full for weeks. For optimum use of your small space choose small plant with high yields. Consider plants that you can eat the leaves like: lettuce, spinach, chard, radish, and onions. If you are looking to add fresh flavor to your cooking grow herbs. They take up very little space and don't need as much water as the bigger plants like tomatoes. 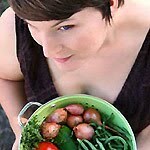 Try parsley, chives, thyme, basil, sage, oregano, rosemary, marjoram or mint. 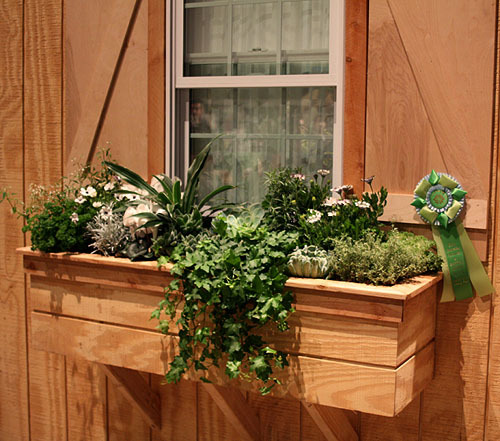 Above is an elegant window box that is mixed herbs and flowers. What are Some Easy Vegetables to Start With? The most popular vegetable to grow is tomatoes! Eighty-six percent of gardeners grow tomatoes. If you have a small space I strongly recommend cherry tomatoes. I don't have any numbers but I am sure that cherry tomatoes produce more pounds of tomatoes over a longer period than standard or beefsteak size tomatoes. Tomatoes need a lot of space and water so be sure not to crowd them. Allow a foot and a half radius of space around each plant, especially when planting in a container. Be prepared to water your tomato twice a day during the hottest parts of the summer. These name tell you that the plant is better suited for your small space. Many nurseries and seed companies are advertising just these qualities in their plants because they know consumers often don't have a lot of space. If you are growing veggies in containers or in small raised beds it is important to make sure your plants have enough nutrients. Soil rich in organic matter is the best way to go. If you are planting in the ground amend the soil heavily with compost. If you are growing in containers use a light potting soil and consider mixing in up to 25% worm compost or other rich compost. Avoid using mushroom compost, it can be salty. If you are growing heavy feeders (plants that use a lot of nutrients) like tomatoes, peppers, zucchini or cucumbers you may want to add fertilizer. I prefer organic, but you could also use artificial. Fertilize your plants when they start to flower and again when they start to set fruit. Keep in mind that whatever you put on your plants will wind up on your plate. I'd like to leave you with that thought. Gardening is something to learn by doing. If this is your first try, start small. If your plants die, try to figure out why, then plant some more. There is a learning curve. You never know what you are capable of until you try. Good luck! the bag is a great idea, cuts way back on weeding! A must in my garden are edible flowers. I love nasturtiums, borage, and violas for this. Nothing quite like putting flowers in your salads and freaking out your house guests!!! This is a great post. Very well organized and good ideas. I love the first photo of the vegetable garden. We have a lot of property, but not enough sun, because our lot is heavily wooded. We are able to grow herbs in pots, but not enough sun for vegetables. Great post! I'm getting so excited for my garden. Two years ago this summer, I was pregnant and looking at vegetables made me nauseated. Then last summer I was too tired to do it. I can't wait for this year, my seeds have already been ordered. I really love your website. It's very clean and you take great pictures. I live right next to the canyon and I tried gardening but everything was eaten by deer and wild animals. Now we only have custus! Your garden ideas are very inspiring! Thanks for finding me first! When we moved to our current house my husband built me a beautiful raised garden, unfortunately our neighbor's palms are shading it so I get only an hour or so of sun a day, not so good for my tomatoes. Excellent post! You've made me yearn for spring even more...I can't wait to get my herbs planted. That first garden is gorgeous...I'm inspired! I'm starting a garden for the first time this year, mostly Korean veggies that are hard to find where I live. I am going to grow some stuff on my own for the first time this year. I just got some bulbs from the library but am usually more utilitarian about things, so I may just use the pot for cherry tomatoes now that i have the soil! 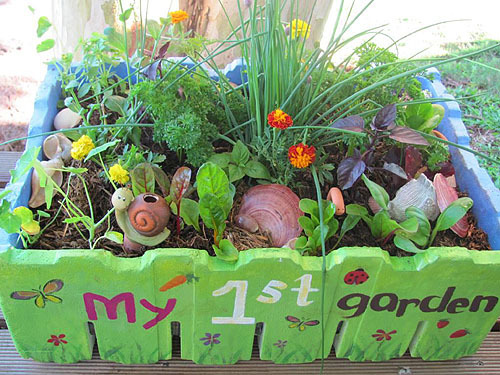 Great post :) We do a veggie garden every year for the past 5 years and love it. Great post! I was just thinking about how to tackle my balcony "garden" this year. I already have my garlic planted. We grow our herbs in a small space in the back yard and get our fresh veggies from neighbors or the farmstands in town. Once I drop some trees in the backyard I will be able to grow a lot more stuff! We use mortar mixing tubs(and drill holes in the bottom for drainage) in our green house to grow lettuces over the winter. I am sure the same would work for patios in the summer. I also have a friend who swears her neighbor grows wonderful tomatoes in gallon cans. That garden in PA is breathtaking!! I do not have the luxury of having a garden like that here in DC, but I have started planting a lot of herbs and hopefully this summer will plant some tomato plants as well. Great post! BTW, our grandparents planted Victory Gardens during WWII because food was rationed. I've taken up gardening because of high food prices and concerns about food shortages. There have been some big crop failures around the world lately. I had a pretty garden last year but I only put my herbs in small pots on the back deck. I hope this year to expand into a bigger space. Thanks for the tips. OMG - this post has got me so excited! On the weekend, my partner and I purchase our very first HOME! And we have a large back yard perfect for veggies! The pervious owner had some fruit trees and told us that some garlic would be coming up soon... I can't wait to get planting! I was all sentimental reading this post since we sold our home and have not been able to garden. Recently moved to Florida and will have my herbs growing on the lanai! Beautiful pictures!!! Our gardens will expand this year ... more herbs, more squash, more beans, more leaf crops. It is a learning curve, but with composting and diligence with the watering and natural pest control, we've been able to 'build' the soil and have had great gardens over the years. Beautiful post! I've been planting here in Southern CA all winter long. It's so much fun and the salads and veggies from the yard are so fresh! I have two raised beds. I'm also starting to incorporate edibles into the landscape ala Rosiland Creasy. Have fun gardening and cooking everybody! Lovely post. We always have a small garden due to too much shade for any larger plot. We love all of the trees here too so it works. We already have been speaking of our plans for this year. Guess it would be safe to say we all have the "BUG"!! I freeze tomatoes after slipping off their skins and enjoy the bounty all winter long in soups and stews and anything else calling for tomato. Much easier that all of the canning we did for years but I still make pickles and jellies for friends and family. My parents and grandparents liked the idea of gardens, but never grew them consistenly. I got the gardening bug shortly after I was married and have had one every place we've lived. My top recommendation for small space gardens is beets because you can eat the greens and the root. Of course, you have to like beets, but I do! I just found your blog today and am enjoying it very much. Great garden. I am trying to plan what to plant this year. I started way too late last year. Cannot sufficiently express my humble pleasure at the Zing garden being held up as an example next to the work of Rosemary Verey. You rock, Foy! !